Several album events are hosted in support of non-profit organizations that benefit women and girls, including PLAN International, Women's Empowerment, the Lower East Side Girls Club, Girls on the Run, and the Los Angeles Downtown Women's Center. A few years ago, this quote from Georgia O'Keeffe got stuck in my head and my heart: "I want real things - live people to take hold of - to see - and talk to - music that makes holes in the sky - I want to love as hard as I can." The world of women has always been my home. But the world of my music, of my piano teachers and the Great Pianists and Great Composers, with their stern, bearded portraits, their hundreds of sonatas and etudes that took up the hours of my days – that was a world of men and I felt not quite at home. It feels like such a privilege to pay tribute to the women who preceded us, the pioneers ahead of their time. The ones who dared to want real things, to reach into the sky. Their courage is the ground we walk on. And it feels like a celebration of our own freedom - hard won, still gaining - to make beauty in the world, to take risks and move out ahead of our own time, with the courage that is our legacy - the courage to reach for real things, to dream as big as we can, and to share this music that makes holes in the sky." 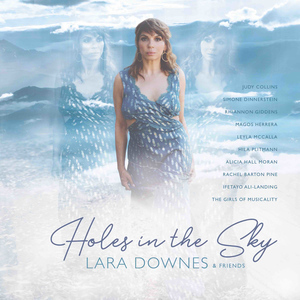 Downes' playing has been called "ravishing" by Fanfare Magazine, "luscious, moody and dreamy" by The New York Times, and "addicting" by The Huffington Post. As a chart-topping recording artist, a powerfully charismatic performer, a curator and taste-maker, Downes is recognized as a cultural visionary on the national arts scene.